The 2014 Barcelona Dressage Tour, two consecutive weeks of international dressage competition, will be the opening event of the 2014 international dressage season in Spain. Barcelona Horses will host a CDI 3* and 4* dressage event during two exciting weeks of competition from 18 – 30 March 2014. It will be the first time ever that a CDI4* will be held on Spanish soil at one of Spain’s finest facilities in Can Alzina on the outskirts of Barcelona. The CDI3* precedes the CDI4* and both are a great opportunity for riders to begin the outdoor season. The venue looks promising and will be a challenging start, or stop over, for riders embarking on a spring tour in the sunny south of Europe. Riders can combine the Barcelona shows easily by starting out in France at the CDI Vidauban at the beginning of the month and then heading further south to the Spanish coast for mid March. While it might still be cold up in the north, the Costa Brava and the Catalonian surroundings promise sunshine and higher temperatures at this time of year, which horses and riders greatly appreciate. Particularly this season with the World Equestrian Games in Normandy around the corner as the highlight of the year, some riders might prefer to start at an outdoor venue right from the start. Can Alzina and the Barcelona Dressage Tour are an attractive choice with great facilities at a state of the art riding center, with 3 outdoor and 1 covered arena, all with top quality Martin Collins footing. There are also showers, a comfortable stable area, parking space and beautiful surroundings. There will be almost à la carte competition for adults and children as well as Young Horse classes, pony tests and classes for U25 riders. The new Medium Tour for future prospects will also be on the program. All in all, among the 15 international judges there are 12 Official 5* ones, a Judges Supervisory Panel identical to the JSP at the upcoming WEG, which is an opportunity “to see and to be seen”. The JSP is composed of 2 very experienced international judges: Ghislain Fouarge (NED) and Dieter Schüle (GER) and reputed international trainer David Hunt (GBR). “This will be the full dress rehearsal for the WEG JSP,” Ghislain Fouarge commented, where they can test their collaboration for the first time together on the field. Annabelle Collins, one of “leading ladies” of the Barcelona Horses Team, stated “we love to have friends and people at our facilities. Serious competition has to go along with a comfortable environment for the riders and that means to count on top technical facilities and at the same time be able to relax and to enjoy with friends and family. With up to 170 participants their won’t be big crowds, no waiting for showers, nor endless cueing for food or drinks, prize givings, etc. We did not want to grow too fast, we rather want an exclusive but warm and welcoming feeling here combined with professionalism. Just what we most appreciate when we go abroad. We love to compete ourselves and we have been to many shows. We tried to keep in mind our priorities as riders, focused on our needs and those of our horses, and we created a venue with a good atmosphere to top it off. We are very exited to be able to host these two CDI’s,” said Annabelle, speaking for the whole team. Barcelona Horses is also coming out with their brand new website: www.barcelonahorsestour.com where all the information about the two competitions will be posted and continuously updated. Big names have already promised their participation! 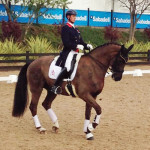 Some of them are friends of the team – we will see Carl Hester at the venue (he has already confirmed!). Carl has always been a fan of Spain and a loyal competitor year after year at the Sunshine Tour. Who would not want to see him? And who knows, Charlotte is usually never far away. The Glock team, Edward Gal, Hans Peter Minderhoud and their trainer Nicole Werner, will head down after Den Bosch for the CDI4*. Morgan and Alexandra Barbançon are excited to come with their horses and their present trainer, Andreas Helgstrand. María Caetano will open the season with her PSL Xiripiti and more Danish and Dutch first class riders have already confirmed their participation. It goes without saying that top Spanish riders are expected at the venue: Beatriz Ferrer Salat, her international trainer Ton de Ridder, José Antonio García Mena, Jordi Domingo, Juan Muñoz, José Daniel Dockx, all these are without a doubt some of the world’s finest dressage riders. Also Spain’s Ex-National Trainer, Jan Bemelmans, can come down with his student Diana Al´Shaer. Together with Vidauban and another state of the art facility further south, the Barcelona Dressage Tour offers a great opportunity for northern riders to escape the cold and have an alternative to the northern European indoor competition. It is also a perfect venue for international riders from other continents who would like to start outdoor competition on European soil in preparation for the upcoming World Equestrian Games. The 2014 Barcelona Dressage Tour is certainly the place to be!